Okay, I must apologize for those of you who have been waiting patiently for a new lesson! It has been very busy with the holidays, guests, events at the Art and Antiques Studio and preparing for new classes coming in January. No more excuses! Here is the beginning of the new lesson! You can follow along with this lesson each day, and if you like, you can visit my etsy shop and purchase ($5) the drawing and reference photo. I will email the references to you and then you can paint along! 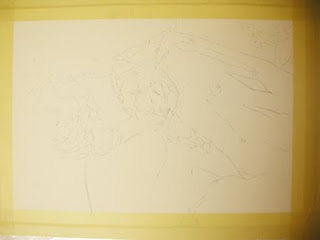 First of all, the drawing must be traced onto the watercolor paper. I like to use a Chunky Graphite Stick from Cheapjoes.com. I scrub a healthy amount of graphite on the back of my drawing, wipe it a little with paper toweling, and then tape one edge of the drawing to my watercolor paper. Trace from the right side of the drawing. Don't press hard or you will leave indentations on your paper and the pigments will puddle into these grooves and cause unsightly marks. Now, tape your watercolor paper onto a foam core board or gator board that is at least an inch or two larger all the way around. I like to use two-inch Scotch masking tape that is beige. The wide tape allows for good coverage both on the paper (at least one-half inch of tape should cover the edges of your paper) and on the board. Good taping will result in a nice, finished painting that dry very flat. The taped edge also provides a nice gripping area when working with large wet washes.